Red Robin welcomes The Impossible Burger as a plant-based meatless patty option that can be selected on any of the casual dining chain's burgers. 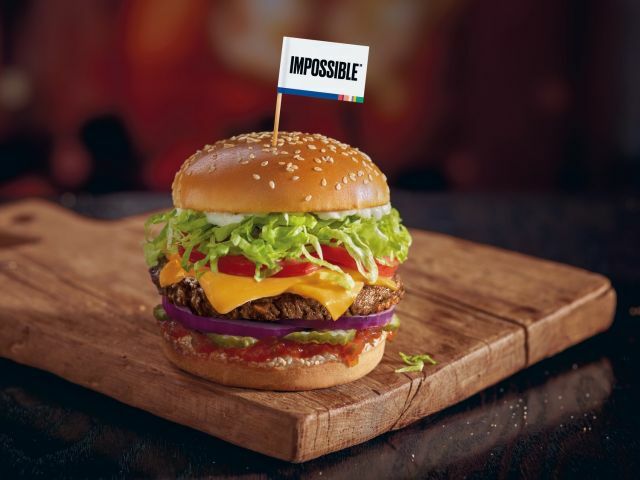 The patty is featured in the The Impossible Cheeseburger, where it comes served with Red's pickle relish, red onions, pickles, lettuce, tomatoes, mayo, and a choice of cheese. As with the rest of Red Robin's burgers, a side of Bottomless Steak Fries is included. The Impossible Burger is meant to be a meatless patty that still offers the taste, aroma, and beefiness of a regular hamburger patty.